We can’t contain our excitement. We’re fast approaching what our favorite times of the year. If you work in landscaping like we do. You really love all the different colors mother nature provides us with. One of the coolest times to seal the color is obviously fall. We move from rich greens in the trees to all shades of yellow, red, and brown. For about a month and a half, our trees take on the look of a world-class piece of art. However, then the leaves begin to fall and fall and fall. At that point you have two choices to make, you can spend hours and hours in your yard or raking leaves and keeping your landscaping presentable or you can let Mankin’s lawn care service do all that work for you. We’ve talked to you before about the great services are lawn care service provides. But if you haven’t called us to set up your estimate, there’s no better time then the fall. 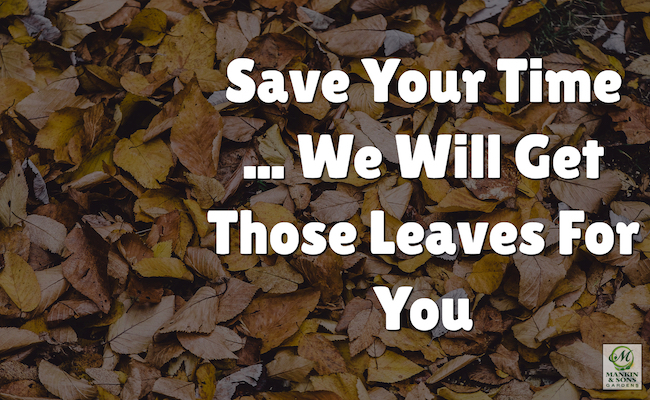 Our team will take your fallen leaves and make sure it helps your grass grow. Also, our team will make sure the leaves are out of your flowerbeds so that they don’t keep your soil from getting the water and sunlight they need to continue providing nutrient rich food for your plants. Fall is the best time to get started with our one care service because it takes hours of labor out of your schedule puts it back into family time and allows you to see our great team at work so you’ll be more comfortable with them when it’s time to take your landscaping out of winterization and into the new springtime. Who better to trust your beautiful landscaping within the team that creates beautiful landscape design for living. Give us a call today and we can figure out how are lawn care service can best help you.